The two inaugurations could not have been more different. When George W. Bush took the oath of office on a rainy day in January 2001, he stood under the cloud of a contested election, sharing a split TV screen with a departing Bill Clinton, who was taking his time leaving town. When Bush, 58, took the same oath four years later beneath a blue sky, he had been re-elected at the ballot box and not in the courts, and the stage was all his. He had cut taxes, dramatically expanded Medicare and presided over the biggest reorganization of the Federal Government since World War II  while also turning the surpluses he had inherited into giant deficits. On foreign policy, he had responded to 9/11 by going to war in Afghanistan and, more controversially, Iraq  deposing the dictator who had bedeviled his father. Indeed, Bush used his speech this past January to call for nothing less than "ending tyranny in our world." 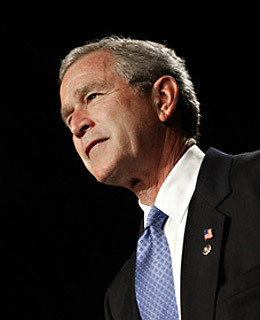 Americans may question Bush's leadership  he has dropped in the polls of late  but no one can deny that he is a leader. It's his agenda that is being discussed at home, whether it's Arab democracy, Social Security reform or the appointment of conservative judges. Bush's re-election also helped lift Republicans  there were seven freshman G.O.P. Senators in the class of 2004, vs. just two Democrats. Bush may not get everything he wants, but he'll get a lot of it, and he has already won some battles, such as the first wave of tort reform and Arctic drilling. Yet it is on foreign policy that Bush will ultimately be judged. Can he help unleash a true democratic tide in the Middle East? While there are encouraging signs in Beirut and Baghdad, it's unclear whether there will be real change or a crackdown. That said, women have voted in Iraq and Afghanistan, and that is surely owing to a President whose influence is as unexpected as it is ubiquitous.